Aircraft have aways had to contend with birds. Last December, a group of investors called the UAS America Fund petitioned the Federal Aviation Administration to create a set of rules that would govern “micro unmanned aircraft.” The basic idea is that these microdrones—defined as being 3 pounds (1.4 kilograms) and under—pose much less of a hazard than many of the model aircraft now flying in the United States, which can weigh as much as 55 pounds (25 kilograms). So it makes no sense to regulate all “small unmanned aircraft systems,” as the FAA likes to call them, the same way, which might well be what the U.S. government has in store. While the rules the investment group has drafted make for an interesting read, what I found particularly eye-opening was an attached report fromExponent, a failure-analysis consultancy. That report tries to quantify the threat such microdrones—a category that includes popular models like theDJI Phantom and 3DR Iris—would pose to full-scale aircraft using data the FAA has collected on collisions with birds. Bird strikes, as these incidents are called, have plagued aviation since its inception. And that’s not surprising. There are a lot of birds—10 billion in the United States, according to Exponent—and some of them get quite large. You only have to think back to the dramatic goose-caused ditching of US Airways Flight 1549 in the Hudson River in 2009 to realize that birds are more than a theoretical threat. Fortunately, the aviation industry and regulators have found ways to reduce these natural hazards. For example, airports use a type of grass that geese don’t particularly like to eat. And aircraft are subject to various regulations about how robust they have to be in the face of something like a goose flying into the blades of a jet turbine. That’s not to say that the aviation industry has this problem licked. By no means. Bird strikes are a very real threat to aviators and their passengers. But as Exponent’s report aptly shows, the severity of the danger scales with the size of the bird, which only makes sense. US Airways Flight 1549, for example, suffered crippling damage to its engines on takeoff after it ran into a flock of Canadian geese, which can weigh as much as 18 pounds (8 kilograms). And there are plenty of other examples of other large birds—pelicans, vultures, cranes, and so forth—creating similar havoc in the air, sometimes with tragic results. But Exponent’s examination of the FAA’s wildlife-strike database reveals something interesting. 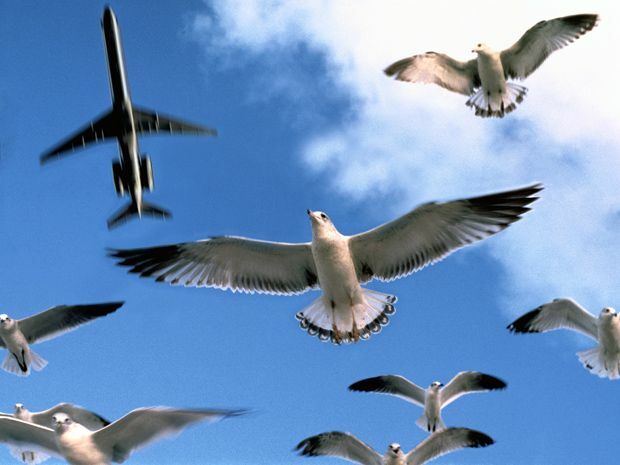 The smaller classes of birds documented there (those the size of sparrows or gulls) rarely cause aviation fatalities. Indeed, the FAA’s database, which records incidents back to 1990, lists only three fatal accidents attributed to small or medium-size birds, according to the Exponent report. And a deeper examination of those three accidents casts considerable doubt on whether a collision with smallish birds really caused two of the three. If you only consider small- and medium-size bird strikes that occurred in places where microdrones would be likely allowed (below 400 feet and more than 5 miles from airports), the results don’t look at all alarming: zero accidents with fatalities and at most a handful with injuries. The earliest of these three fatal accidents took place in 1994. According to the ensuing report of the National Transportation Safety Board, the helicopter involved crashed not because of an actual collision with one or more birds, but because the pilot took aggressive evasive actions to avoid a flock of birds and inadvertently overstressed his aircraft. The rotor then struck the tail boom, and the helicopter dropped out of the sky. The second of the three fatal incidents took place in 1998. Here it was a fixed-wing aircraft involved. Two people flying in the plane died. Thankfully, the plane killed no one on the ground, despite crashing into the roof of New Jersey condo. The type of bird responsible for this tragedy remains unknown. Actually, investigators are not at all sure there really was a bird involved. The evidence for some sort of avian component to this accident consists of one witness’s report that she saw a large number of birds flying in the area. There was some enigmatic damage to a portion of the plane’s horizontal stabilizer, but no bird feathers, blood, or remains were found on the plane. Swabbing by ornithologists called in to examine the wreckage failed to turn up bird DNA. And after reviewing the relevant photos, the Air Force’s Bird/Wildlife Aircraft Strike Hazard Team, like the ornithologists, demurred in attributing the damage to a bird strike. This leaves only one more fatal accident in the FAA database that has been ascribed to a small or medium-size bird. This one, the crash of a helicopter ferrying oil-field workers to offshore platforms in the Gulf of Mexico, took place in 2009. Two pilots and six of the seven passengers died. Although there was no obvious evidence of a bird strike on initial inspection of the wreckage, swabs sent to the Smithsonian Institution’s feather-identification lab turned up DNA from a female red-tailed hawk. Such birds generally weigh a kilogram or perhaps slightly more (say, 2 to 3 pounds), so it’s surprising at least to me that a collision with something this small would be enough to take down a helicopter. The National Transportation Safety Boards summary of this accident hints at a complicating factor, however: a windshield that might not have been up to par. You see, the company running this helicopter-ferry service had had issues with the stock glass windshields on its helicopters delaminating, so they replaced them with aftermarket acrylic windshields, which according to theNTSB report hadn’t been tested for their resistance to bird strikes. And an identical acrylic windshield installed in a different helicopter allowed a colliding gull to pass right through it three years earlier. But that incident hadn’t caused this obviously fragile windshield design to be removed from service generally. So some bird strikes can be darn dangerous. But despite that fact, and despite the enormous numbers of these creatures zooming around the sky, only very rarely do collisions with smaller varieties of birds kill people. Less serious accidents aren’t, however, uncommon. According to the Exponent study, the FAA’s database has a total of 150,000 entries, and out of those, there are 13,906 reports that note damage from small or medium birds. And there are 227 incidents noted that had non-fatal injuries. Of course, we have no idea how many inconsequential bird strikes go unreported. So it’s hard to judge odds of a bird strike being significant from these numbers. What’s more, if you only consider small- and medium-size bird strikes that occurred in places where microdrones would be likely allowed (below 400 feet altitude and more than 5 miles from an airport), the results don’t look at all alarming: the Exponent report says there have been zero fatalities and at most a handful of accidents with injuries. So why not let drones of a size that pose comparatively little danger fly without imposing onerous restrictions on them? Any flub-ups that bring a full-sized aircraft and a microdrone to the same area and altitude are bound to be no more worrisome than the situation equivalently sized birds have long put aviators in. And we’ve somehow put up with that.